Latest satellite imagery shows the river Brahmaputra disappearing into a 900 m underground tunnel in China. 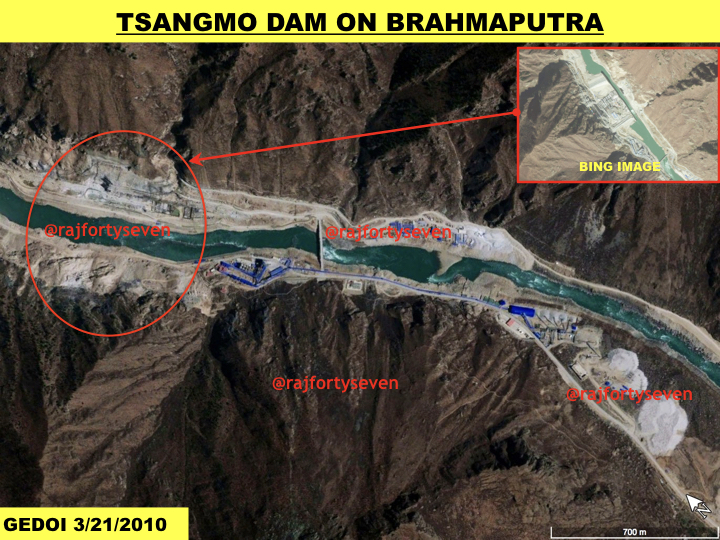 In what is perhaps the first evidence of a possible diversion project by China, latest satellite imagery shows a massive new dam on the Brahmaputra river — Yarlong Tsangpo in Tibetan — with an underground tunnel that seems to engulf the entire water flow for almost one kilometre. The Brahmaputra is sacred to Indians and Tibetans alike and has its origins in the Angsi Glacier in Purang county of Tibet. It has been in the news for water reportedly turning black on the Indian side and in connection with Chinese plans to divert it to the arid lands of the Taklamakan desert. Although the Indian government has said that there is no evidence of any water diversion project, satellite imagery from 26 November 2017, courtesy US commercial vendor of space imagery DigitalGlobe, indicates a new project in an advanced stage. This report – based on latest satellite images — examines only the actual ground position. Measurements are made on very low resolution images and may not be exact. The available images show a new 200 m wide dam that seems to have completely blocked the water of the Brahmaputra. The entire river seems to be forced into two inlets of almost 50 m width each towards the west of the river. The water flow comes out after around 900 m downstream in two outlets very similar to the size and shape of the inlets. The project – currently under construction – is located 60 km east of Shannan township as the crow flies. The location is also almost 40 km east of Sangri county. What has raised questions about this project is that another project – Tsangmo or Zangmu Dam — has recently been constructed just 13 km downstream. This run of the river dam was made operational in end-2015 and has a capacity of 510 MW power production. Beijing did not pay any attention to India’s objections to the Tsangmo dam. The construction of another dam 13 km upstream of Tsangmo which diverts the entire water inside the mountain suggests that its purpose may not just be hydropower generation. The purpose of this project is possibly for diverting a portion of the Brahmaputra to the parched areas of Taklamakan desert. 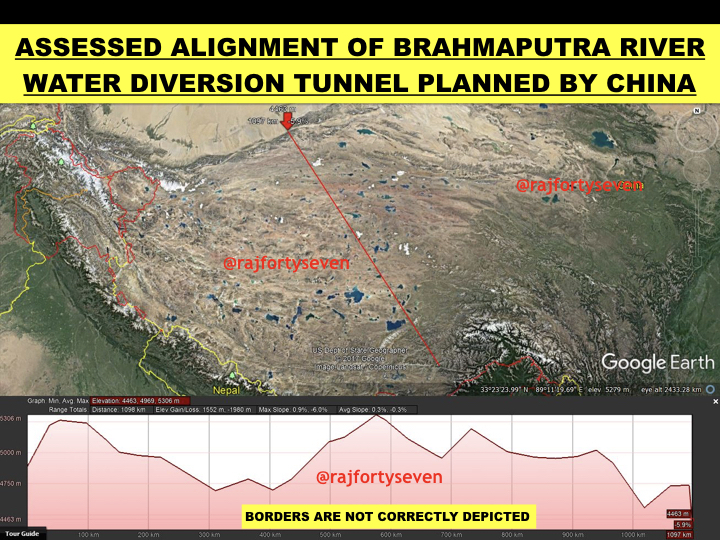 The geography of the area, when studied deeply with the elevation profile, clearly indicates that China may actually be planning to divert the waters of the Brahmaputra approximately 1,100 km northwest of the project site. The path indicated on the image below shows the possible route of the underground tunnel which does not touch any water body on its way. The height difference at the project site and the point of Taklamakan desert suggest that a clear downslope will be available for the water to flow naturally without any additional constructions for large storage wells in between. India being downstream of the Brahmaputra has full rights over its waters and any diversion of water from this river could likely hurt Indian agriculture. During any emergency, a sudden release of water from this project can also cause havoc on the Indian side. Satellite imagery shows that polymer resin adhesives are being sprayed by China all around this project area as a dust suppressant system. The resin adhesives are commonly used for large construction projects but are never used for projects near water, according to some water projects construction engineers, since these polymer resin adhesives are said to be harmful to humans and animals. The resin sprays have been observed over the last two months. The rough estimate of time for water flow to reach India from this project location is 15 to 20 days. The colour of the Brahmaputra water in Assam acquiring a darker shade, according to reports in the media, could possibly be due to the use of these resin adhesives at this project site. Satellite images clearly show stone crushers and cement plants at the site. The products of this facility are obviously used inside these tunnels for construction purposes. The material being quarried from inside these tunnels is being piled along the river up to the road level. Most of the stones have been crushed to different sizes and some of it may be pushed into the river along with the water flow. A large number of tippers and other vehicles are seen carrying material to and from this area. An administrative area is also seen east of the project with a large number of red-roofed houses and barracks, possibly living quarters for staff and may also contain administrative buildings. It is too early to come to a conclusion that China is diverting the entire Brahmaputra before entering India. Discussion through diplomatic channel is definitely necessary. By the way, even if the entire stream is diverted, will the Brahmaputra valley become a desert as spread by the local news channel. Assam & Arunachal have lot of rivers to feed the Brahmaputra. Some problem may come in the dry season of course. So let us not lose heart and urge the Central Government to initiate dialogue with China. India should completely stop the flow of all west flowing rivers which enter Pakistan. We also have an entire Thar desert to irrigate. China can’t divert that river to desert because low land desert is thousand miles away, it can’t be done today or any forseeable future, even if China wants. And without that thousand miles of tunnels to low land desert, China can’t divert the river any where up to the high platues. (Even if you pump the water upto the platues nearby, it will eventually ended into the rivers). In a word there is no easy way for China to divert the river to anywhere, either too far, or to high. What’s more, around the river it is not feasible to build industry or agariculture center due to traffic communication and environmental feasibility, that means even local consumption of water is not possbilee, too. Apparently that tunnel seen in the imaginary is for power plant. In construction phase, all water is better to be diverted around the construnction site. In operation phase, that same tunnel can be used for power generation or flood releasing. Be alerted is ok but don’t lose logic India friends. Surveillance aside , this shouldn’t worry us one bit. 2. The kind of watershed that Tibet contributes to Bramhaputra is just one portion less than a fifth. Higher being from catchment areas of tributaries when it enters India, highest being in Assam. For fellow news readers, stop fear mongering! a detailed write up (link posted below) would help erase any fears, that, we’ve had a “Foreign Policy Failure” and all that. Its world of information & you guys need to read up a bit. Appreciate the time and effort put in by the author but we need more than Google Earth imaginary to reach at conclusions. Being a “space technology superpower” I certainly believe that people in govt must have better access to tools and means to come up with concrete evidence. Certainly the image shows daming but as suggested a) if upstream dam is being designed for diversion then one can not envisage run of the river scheme 13 kms down stream. B) we need to ascertain wheather there is decline in lean period discharge in our reach of river, If yes than certainly we need to fight for our right. What is alarming is that China has stopped sharing hydrological data’s. Without genuine upstream hydrological data’s , hydraulics of river couldn’t be ascertained down stream. C) As far as quality of water is concerned, it’s not a rocket science to analyse the constituent of water. I am amazed even after weeks we don’t know what is increasing the turbidity of brahamaputra water. My take will be , let’s refrain from drawing conclusions without proper analysis and evidence. India is left with no option but to force China to stop or reverse the construction of tunnel & the river diversion at the earliest. It is clearly evident that Indias foreign policy is getting weaker every day with Modiji in power. Other than mass propaganda and fly-by-night diplomacy it is proven beyond doubt that Modiji do not have courage to confront China. You are absolutely right! Feku is an unmitigated disaster for the country, as rightly predicted by MMS in 2014! New dam is going 2 make entire north east India a desert arround 4 crore people will suffer.India govt should take d matter immediately chainese counterpart but recent foreing minister meet of india n china didnot matter this issue which is a matter of concern 2 entire NE. I’m not sure if you really are a major general, but if you are, I am genuinely worried that a naive person like you rose up the ranks that high. I really hope you’re only a teenager somewhere pretending to be a major general. Anyways, I’m not sure how many betrayals, veiled attacks and even direct, confrontational attacks from China it would take for one to realize that China can, will and is doing everything it possibly can to undermine India. They’re being increasiongly open about their intentions too these days. Openly blocking Masood Azhar at the UN, Openly blocking India’s bids at the UN security council, openly blocking India’s NSG bid, making vast and ever-increasing territorial claims and so on. China is on a drive to green swathes of territory in Tibet, and Xinjiang which are currently hostile, inhospitable and basically barren. 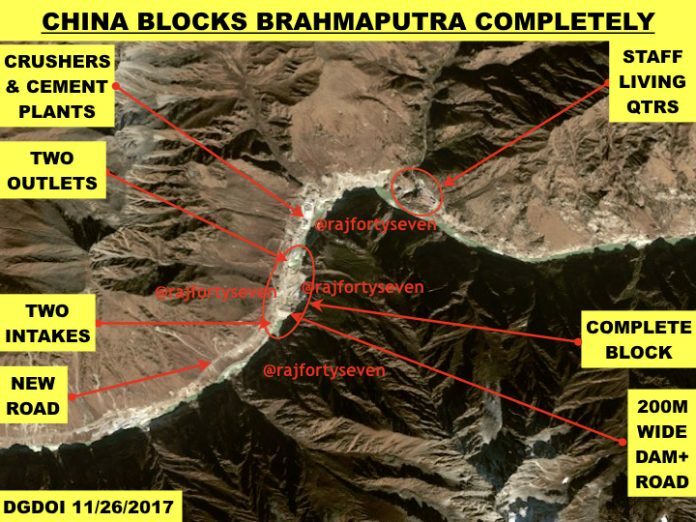 In diverting the Brahmaputra, the Chinese also have the other tactical move over India wherein they can significantly slowdown India’s progress. A Double whammy. This is exactly what’s happening. China needs to be dismantled. Any diversion of the river would lead to a massive decline in water available for agriculture in India. The government must examine the latest satellite imagery and must take actions nexxesory. It’s evident that China would never ever bow to Indian demands, the only option left would be to excerpt international pressure. Everything will.depend on how we can exercise our foreign policy. It’s high time to play as a hard power rather than a soft power. India must be aware of the strategic designs of some foreign powers to see that India and China may not be allowed to live in comparative peace, so that these powers are able to restrain rising India. This is one part. Another part is that it is possible that China might be doing what it is being reported here. Way out for India: India MUST analyse the Brahmputra waters to find out the residue of resins etc. and make sure of the truth of these allegations. If it is so, India MUST not only protest to China but also participate actively in the South China Sea coalition against China and contain China’s agressive designs. This government has been an utter failure in terms of foreign policy as well as internal and domestic policies. I do not expect them to be able to perform any such activity. At best, they will suppress this news from the mainstream media! Premature to reach a definitive conclusion. Possible yes but more in the realms of fantasy. Needs more examination. Tunnels may be for generating power! Do you need to divert the complete flow of a river for power generation? There is a power generation dam just 13km downstream. Why do you need another one so close? No power grid or power lines observed. Obviously purpose of this diversion not likely to be power generation only. In any case, it is illegal for China to stop a trans-border river completely. Yes, when building a power station on a river, in many cases you need divert all flow of a river, and then divert back once completed. In some cases when the river is wide enough, you can just block one half river first (hence divert all flow to another half river) and build that half part of station firstly, then switch the flow back and build another part of the station. India should drop few nuclear bomb on china soon.